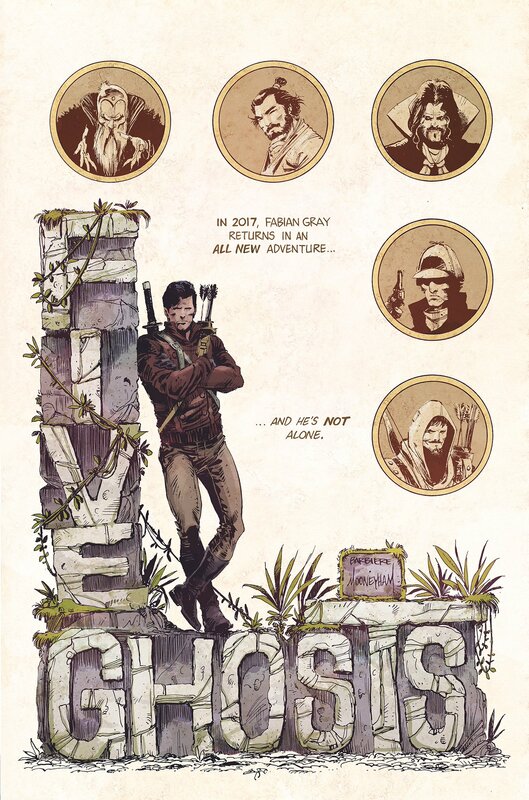 Frank J. Barbiere and Chris Mooneyham’s pulp adventure set to return later this year. Barbiere and Mooneyham, along with colorist Lauren Affe, launched Five Ghosts about five years ago, first as a Kickstarter and later as a series from Image. In the first storyline, we learned Fabian Grey had come into contact with something called “The Dreamstone” that gave him access to the powers of five ghosts: “The Wizard,” “The Archer,” “The Detective,” “The Samurai” and “The Vampire.” They correspond with certain literary characters, specifically Merlin, Robin Hood, Sherlock Holmes, Miyamoto Musashi and Dracula. Set in the 1930s, the pulp adventures took Fabian, his ghosts and supporting characters like Iago and Jezebel around the world. No word on exactly when those adventures will kick off again, but Barbiere says to watch his Twitter feed for more information.